August is national peach month! I absolutely love peaches and wish that they were available year-round, but since this isn’t the case, I go absolute peach crazy as soon as they start appearing in the stores. After last months Improv Challenge, I went on a pinning spree marking all of the recipes that I wanted to try. (I think it might have been ALL of them) As we were currently ice cream-less in the freezer I knew I wanted to make this right away. 1. Mix 2 tablespoons of the milk into the cornstarch in a small bowl. Make sure no lumps remain. 2. Whisk cream cheese and salt together in a medium bowl until smooth. 3. Combine the remaining milk, cream, sugar and corn syrup together in a large saucepan over medium-high heat. Bring to a rolling boil for 4 minutes, stirring frequently. Remove from the heat and gradually whisk in the cornstarch mixture. 5. Whisk 1/2 cup of the milk mixture into the cream cheese until smooth. Then add remaining milk and basil. Cover tightly with plastic wrap. Use a fork or a knife to make small punctures in the plastic wrap. Refrigerate for 2 hours or until fully chilled. 6. 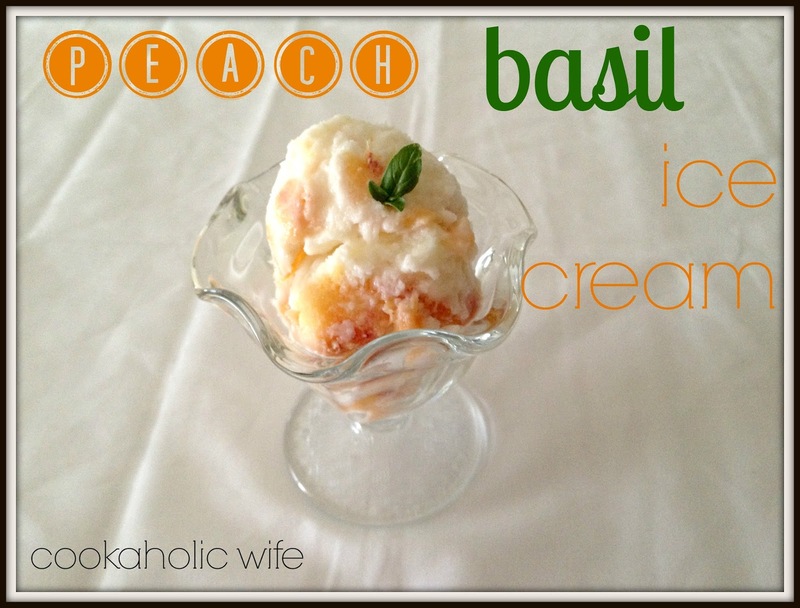 Strain out basil and pour into your ice cream maker. Process according to manufacturers directions. 7. Stir in peaches at the end. Freeze according to directions. 8. Serve topped with fresh peaches. 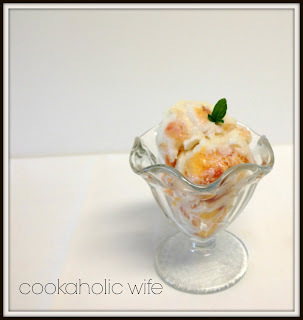 For whatever reason my peaches didn’t completely incorporate into the ice cream. They mainly stayed at the top, which means instead of my OCD method of scooping even layers of ice cream from the top, I have to dig down to actually get some ice cream and now just frozen peaches. If you are not a huge fan of basil, I would significantly decrease the amount of it in this recipe. The smell of it mixed with the ice cream puts off an odd smell but the flavor isn’t really affected.